Dungeon RPG sequel due out in Japan in spring 2017. The latest issue of Weekly Famitsu has the scoop on the long-awaited dungeon RPG Dungeon Travelers 2-2. The sequel is set in a world where the battle against the final boss in Dungeon Travelers 2 was lost. It follows a new adventure of the characters that fell into darkness, led again by protagonist Fried Einhard (voiced by Taishi Murata), who also fell into darkness. The heroines have opposite personalities, as well. Dungeon Travelers 2-2: The Maiden Who Fell into Darkness and the Book of Beginnings is due out for PS Vita in Japan in spring 2017. Update 9:45 a.m.: New details have come in. The darkness befallen Fried appears smaller and more boy-like than the Fried from Dungeon Travelers 2, but his obsession with monsters and natural instincts are without change. The heroines’ appearances have also changed to a darkness befallen state, becoming more monster-like. The battle system has been upgraded from the previous game, and the user interface improved so that it’s easier to use. You can also check the battle backlog, and in dungeons there are areas where magic effects are stronger. Fried Einhard (voiced by Taishi Murata) – Defeated by the the Demon God, he lost all of his memories of the past. In his darkness befallen state, he appears boy-like, and has red eyes and unkempt hair. Souffle Twinny (voiced by Ayane Sakura) – A treasure hunter who loves Therians. She took on the Demon God with Fried and company, lost the battle, and went missing. In her darkness befallen state, she wears a black robe and has a crow on her shoulder. Yuni Korgtech (voiced by Hisako Kanemoto) – A pure and innocent troubadour. After losing the battle against the Demon God, she grew wings and went missing. In her darkness befallen state, she is much more exposed and has large wings. Grisherina Efleanor (voiced by Yu Shimamura) – A polite and strong veteran explorer. She was Irena’s friendly rival, and disappeared somewhere after losing the battle against the Demon God. Her appearance in Dungeon Travelers 2-2 is unknown. Yae Houzouji (voiced by Yura Hasegawa – a different voice actress from the previous game) – A woman of a distinguished family from the Lachann Empire that values the martial arts. She disappeared after being defeated by the Demon God. 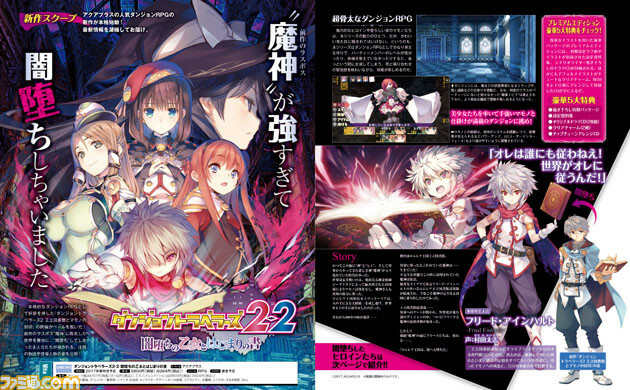 In Dungeon Travelers 2-2, her eyes are shining red and she has a sharp tail. Her weapon is a Gatling gun. When it launches in Japan in spring 2017, Dungeon Travelers 2-2 will cost 5,800 yen for the standard edition, 4,761 yen for the download version, and 8,800 yen for the Premium Edition. The Premium Edition includes creation materials, an original drama CD, two clear charms, and a background music arrange CD. Development is currently 70 percent complete.